The earth’s crust is the major source of metals. Seawater also contains some soluble salts such as sodium chloride, magnesium chloride, etc. The elements or compounds, which occur naturally in the earth’s crust, are known as minerals. At some places, minerals contain a very high percentage of a particular metal and the metal can be profitably extracted from it. These minerals are called ores. You have learnt about the reactivity series of metals. Having this knowledge, you can easily understand how a metal is extracted from its ore. Some metals are found in the earth’s crust in the free state. Some are found in the form of their compounds. The metals at the bottom of the activity series are the least reactive. They are often found in a free state. For example, gold, silver, platinum and copper are found in the free state. Copper and silver are also found in the combined state as their sulphide or oxide ores. The metals at the top of the activity series (K, Na, Ca, Mg and Al) are so reactive that they are never found in nature as free elements. The metals in the middle of the activity series (Zn, Fe, Pb, etc.) are moderately reactive. They are found in the earth’s crust mainly as oxides, sulphides or carbonates. You will find that the ores of many metals are oxides. This is because oxygen is a very reactive element and is very abundant on the earth. 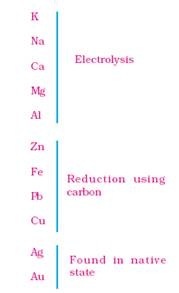 Thus on the basis of reactivity, we can group the metals into the following three categories (Fig. 3.9) – (i) Metals of low reactivity; (ii) Metals of medium reactivity; (iii) Metals of high reactivity. Different techniques are to be used for obtaining the metals falling in each category. 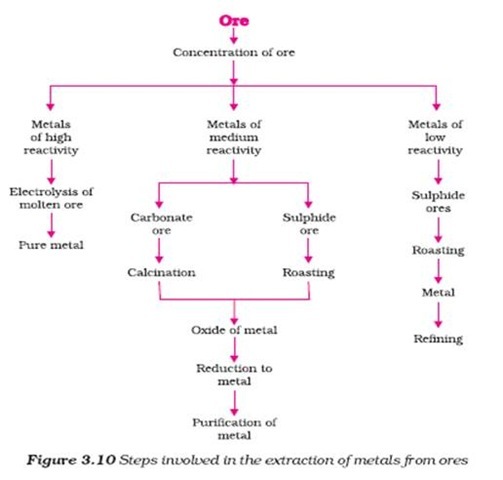 Several steps are involved in the extraction of pure metal from ores. A summary of these steps is given in Fig.3.10. Each step is explained in detail in the following sections.